This is a good movie for all ages!!! Well this movie came to a big suprise. I'll admit it, I'm 20 years old, and I LOVE this movie. Most family films tend to have shallow scripts, and mindless slapstick that are just meant to entertain insted of entrall, this movie is so much better than that. This movie illustrates best how unconfortable it can sometimes be to grow up when you're a teenager. And, most importantly, this movie shows us a honest story about the relationship between a father and a teenage son. Like in all good stories, the characters in this movie go on a physical and mental journey. Honest situations and true-to-life characters (other than the fact that they are talking dogs) make this very enjoyable. Unfortunately the DVD is almost featureless, and doesn't even have widescreen. Amazon's in house reviewer above said "strictly for young fans." No, this is also for any adult who loves animation. I didn't like Goofy until i saw this movie. But I loved the way they wrapped a clever-thoughtful guy inside the awkward exterior. It gave me a new perspective. I'll admit a couple of the songs were a bit painful, but there are so many great gags and great sequences in this story I couldn't help but be impressed. This is way better than some of the high-budget princess movies Disney was grinding out at the same time. And this was done by Disney's second string animators... wow! I don't know how many times I must've seen this movie, but it's probably the one I've watched the most out of all of 'em! You just can't resist watching this movie that is for all ages. Especially if you're a teen, you can understand what it's like having to deal with a parent who just wants to do what's best for you, but you just want to be left alone. It's a great family movie, about a vacation gone wrong, but when you think it was bad, it actually turned out good. It has great catchy music, the plot thickens, it's a great kids movie that you can watch over and over and over again. The very first time I saw this movie was while I was on a baby sitting job. The kids kept insisting we watch "goofy movie! goofy movie!" at first I was like "Oh great, another little kids movie..." but from the very beginning of the movie I was laughing. This is a great movie! Six years had past since then and I hadn't seen it in a while until it came on the Disney Channel. Upon seeing it again I knew I had to own the movie. The plot is sweet, and though Max shows obvious resentment towards his fathers "goofy-ness" and the obvious effect it has on him too, you get the sense that he really does love his father, he just forgot how to show it. I give the movie a 5, because I value family relationships over and above ANYthing else in a movie. Sure it was funny, but the family qualities in this movie are great. The best Disney movie ever! Had this movie been made as a full fledge addition to Disney's classic library, this would not do. But just as a pleasent revisit to one of Disney's all time great characters, it better than O.K. The movie is well done, no contrived story or anything like that. Had it been inducted into the "Disney Classic" library, a lot more work would have needed to be done as far as quality goes. The title of my review is one of the most memorable quotes (to me, at least) in this movie. Maybe I won't remember the plot 20 years later, but I'll be able to shout "Who's your favorite possum?!" at my sister and she can respond, "Lester!" It was an amusment park (looked kinda like a tavern) that Goofy and Max went to on their 'trip'. I like the song they sing in the beginning when they are in a car. Wow, this is truly one of my favorite movies and fave Disney fliks ever, i am a disney lover. This is about Goofy's son " Max" who wants to impress his girlfriend " Roxanne" by going to a special concert in Los Angeles played by his favorite sinfger " Powerline" ( who is sort of like a Goofy version of Prince), unknown to Goofy, Goof is actually taking Max on a fishing trip but Max decides to change everything so that he can impress her. A highly entertaining, heartwarming and meaningful animated feature full of laughs, insight gags, good animation, great soundtrack and a important lesson about Fathers and Son. Simply hilarious! A road trip you won't forget! The coolest Disney movie around! "MAX-I-MUM ~ It's The Goof Boy!" 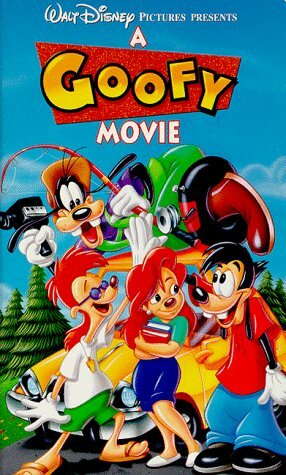 The wonderfully hilarious animated film `A Goofy Movie' was released in '95 minus all the fanfare that generally accompanies a Walt Disney Production. It is definitely one of the lesser known amongst all the great Disney features, but it happens to be one of my personal favorites. Join Goofy (a.k.a. : Mr. Goof) and his son Max on their madcap vacation trip as they drive across the country on a father/son bonding venture. Who could ever forget Max's Powerline imitation, Bobby's "Tower of Chessa", Lester's Possum Park, Bigfoot dancing to "Staying Alive" or the lovely and demure Roxanne. This little gem of a film is an unforgettable adventure that will be enjoyed by the inner Goofy in all of us. I had forgotten how awesome this movie is- even for a grown-up, like me. It could do without all the songs (it was made before Disney wisely decided to ditch all the cheesy singing,) but it's brisk, double-layered humor more than makes up for it. Kids will think the gags are sufficiently silly. Adults will pick up on the nearly-sarcastic, nearly risque dialog, so rare in Disney animated movies. Plus, Big Foot dancing to 'Stayin' Alive' is just freaking hilarious. I used to watch this on VHS with my sisters when we were younger. We watched it in the theaters and then forced our parents to buy us our own copy, which we watched all the time. I purchased this DVD last year and I STILL love it 12 years after its initial release. I definitely thought this movie was funnier when I was a kid, but even now I think it's just as enjoyable as it was then. I love the songs-- we used to sing along when we were younger. I even bought the soundtrack! First cartoon movie that I can remember that appealed to adults.